The Guthrie Theater is opening their 50th anniversary season with three plays by British playwright Christopher Hampton (author of the play and movie version of Dangerous Liaisons). Tales from Hollywood, a dark comedy about exiled Germans in Hollywood in the 1930s, is playing on the Thrust stage. Embers, "a fascinating study of passion (love and hate), truth, friendship, the urge to be the stronger and the need to survive," is playing in the nine floor Studio Theater. 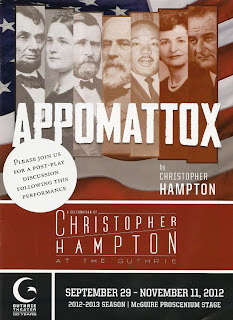 I'll see both of these plays in a few weeks, but I began Hampton-fest with the new drama Appomattox, playing on the Proscenium stage. 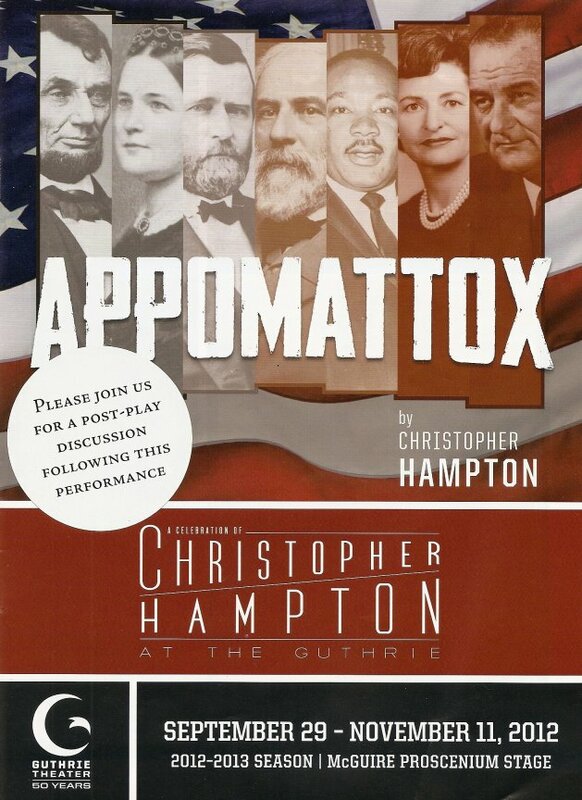 It's an epic historical drama that tells about two important moments in our nation's history - the surrender of the Confederacy in 1865 at the Appomattox Courthouse in Virginia, and the passage of the Civil Rights Act a century later. With a running time of three hours (including one intermission), it's a long play and a heavy one. At times it feels long, but it's also a fascinating look at our history with impeccable staging, sets, and costumes. The play is structured in two acts that are almost like two separate plays, but with related themes and the same cast of actors playing a character (or two) in each act. It's a little like the repertoire days of old at the Guthrie. The first act centers on battles of the Civil War, while the second act centers on legal and political battles for Civil Rights. The play draws parallels between the two periods, aided by the fact that often the same actor plays related characters in each act. Harry Groener plays President Lincoln and President Johnson, two very different men but both effective proponents of Civil Rights. Harry really provides a center to the play. His portrayal of LBJ is incredibly engaging and charismatic - he is quite a colorful character, speaking with frank language and funny and folksy metaphors. Mark Benninghofen is a grounding force playing both presidents' right-hand man - General Grant and attorney general Nicholas Katzenbach. The divine Sally Wingert plays both first ladies, who are about as different as the two presidents. One a bit crazy and dramatic, the other more sane and strong, but both sharing their opinions with their husbands about how the country should be run. The cast is huge and features many fine performances, some quite brief, including Joe Nathan Thomas as Frederick Douglass and Shawn Hamilton as Martin Luther King, Jr. The play ends with a short scene in the present, showing us that the past isn't that far behind us. The Guthrie does period pieces like no other. Scenes and set pieces move in and out on sliding panels, with actors freezing at the end of scenes, like moving historical tableaus. The costumes are perfection, especially in the first act - military uniforms and hoop skirted concoctions that look good enough to eat! Photos are projected on the back wall of the stage, showing scenes of war or riots, or providing a backdrop for the action. Larry: How old is this country? Larry: How long have black people been allowed to vote? 48 years is a relatively short time in the history of this country. There are African American people alive today who can remember when they weren't able to vote. I can't imagine how that must feel as things start to move the other way again, towards exclusion rather than inclusion. Despite being a historical drama, the themes of this play are very timely. I'm not sure how a British man capture American history so well. The three plays in the Christopher Hampton celebration seem quite diverse. This American drama is pretty intense and thought-provoking; I look forward to seeing the other two plays.